This project entailed creating packages for eight new product flavors in two sizes, as well as a bilingual edition. Standard cleaning and screen saver kit for most handheld computers. Retail product used to market a new multi-language software product. English to German, French, Spanish, Italian, Japanese and Chinese. A new look with distinctive icon graphics to simplify product category. One of many product line packages designed for the International New World Wine Corporation. 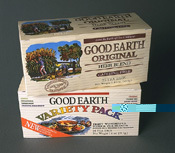 Retail food products selling herb teas throughout the US.